If we are to make a complete repressilator, we will need a green light-sensing BioBrick to go with the red and blue. To our knowledge, there has been no green light sensor successfully used in E. coli. Tokyo-Nokogen 2009 attempted to make a green light sensor but couldn't get it to work, due to problems with the BioBricks stored in the Registry. At first, we hoped to use the α-helical domain of an allosteric protein to couple the light receptor and repressor, a strategy that has been successfully utilised previously in the blue light sensor fusion. However, this method would have likely required the usage of Statistical Coupling Analysis to measure how much the amino acid distribution at some position i changes upon a perturbation of the amino acid distribution at another position j. It was thought that such analysis would be beyond the time constraints imposed upon the project, and thus this strategy was abandoned in favour of the alternative described below. Our next design involved the fusion of PhoR and CcaS to create a coliroid like green light sensor, by replacing the downstream portion of the CcaS with the downstream portion of PhoR based on the fact that both contain the same domains HisKA and HATPase-C (Figure 2). PhoR phosphorylates the response regulator PhoB, which then will binds to conserved DNA sequences called phoboxes and interacts with the σ70 subunit of RNA polymerase to control transcription. Thus, we can add the reporter gene here as a response to the detection of green light. The green light sensor is assembled but we have not had time to test it yet. We will test it and bring preliminary results to the Jamboree. Figure 2: Our proposed green light sensor, combining the CcaS domain with the PhoR-PhoB response pathway. The 3D structure of CcaS and PhoR has not been fully documented, although portions of their domains have. Thus, we are not able to accurately predict the fusion from their structure. GAF: The phytochrome domain, which is PCB here, is covalently anchored at a conserved cysteine residue in the GAF domain. PCB (phycobilin, which is introduced into the E-coli): Light activates the PCB to trigger a Z to E isomerization as well as subsequent conformational changes of the chromophore and the apoprotein, leading to the downstream processes. HK: Domain B of the HK phosphorylates and then transfers the phosphorylation to domain A, which then phosphorylates PhoB and leads to the expression of the reporter gene. The cut will be positioned between amino acids 475 and 525, which is between the PAS and HisKA domains. The cut will be positioned between amino acids 150 and 195. As we have only just begun working with this part in earnest, it is difficult to predict what problems we may encounter. However, we do fully expect to run into many of the issues that we've experienced in our red and blue light sensors as well. Our green light sensor has not been formally submitted as DNA to the Registry, but we do have sandbox BioBricks for it. These include the phoA promoter that we hope to express using the PhoR pathway, the green light sensor proper, and a composite construct with a lacZ reporter. BBa_K322117: phoA promoter with lacZ reporter. BBa_K322119: CcaS-PhoR green light sensing protein. 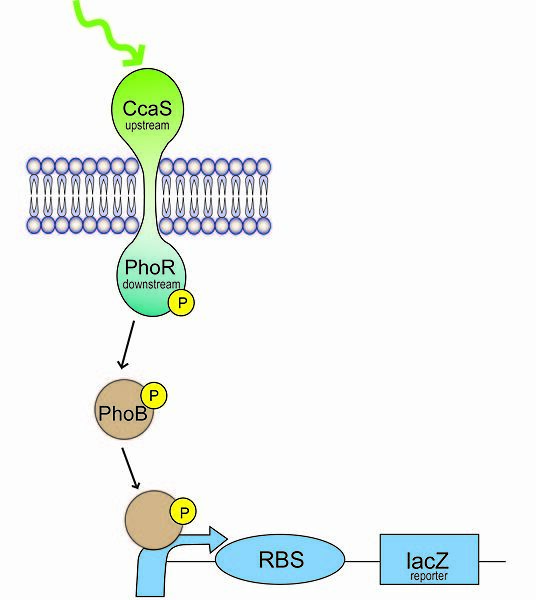 BBa_K322120: CcaS-PhoR with lacZ reporter system. Again, as we have yet to begin experimenting on these parts, we have not yet acquired characterisation data. We hope to have preliminary data in the near future.